The world is full of books. 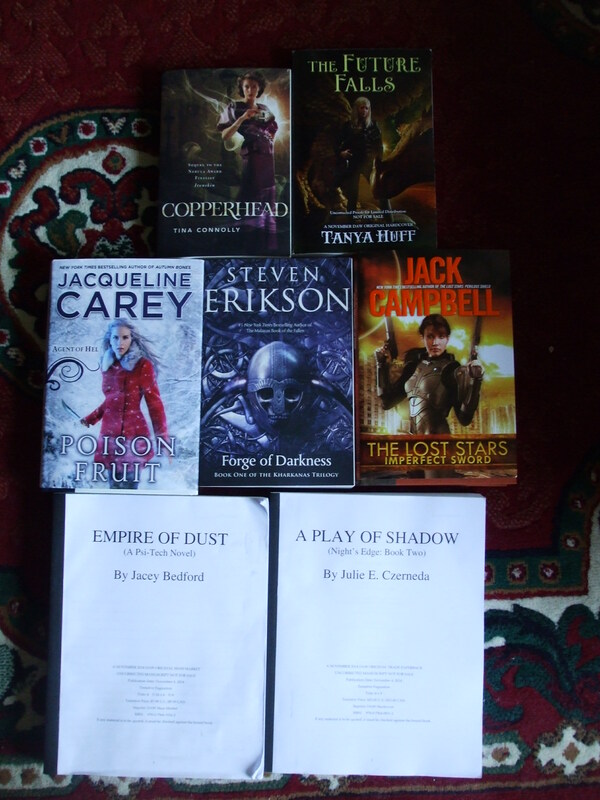 That’s Tina Connolly’s COPPERHEAD (Tor), Tanya Huff’s THE FUTURE FALLS (DAW), Jacqueline Carey’s POISON FRUIT (Ace), Steven Erikson’s FORGE OF DARKNESS (Tor), Jack Campbell’s THE LOST STARS: IMPERFECT SWORD (Ace), Jacey Bedford’s EMPIRE OF DUST (DAW) and Julie E. Czerneda’s A PLAY OF SHADOWS (Daw). Sometimes the height of Mt. TBR gets a little daunting. This entry was posted in glamour, SFF and tagged books, Jacey Bedford, Jack Campbell, Jacqueline Carey, Julie E. Czerneda, pictures, Steven Erikson, Tanya Huff, Tina Connolly. Bookmark the permalink.